ESCMID/ASM Conference on Drug Development, Lisbon. The ‘ESCMID/ASM Conference on Drug Development to Fight the Challenge of Antimicrobial Resistance’ was held last week in Lisbon, Portugal. Over 360 delegates and faculty gathered for 4 days of presentations, plenaries, roundtable discussions, as well as an extensive poster program. Our thanks to all speakers, chairs, abstract authors, and organizational staff, for making this event such a great success. Submission of abstracts for ECCMID 2019 are open, and will close on 28 November 2018.Find out more at the ECCMID website. The deadline for submitting proposals for ESCMID’s research grant round 2019 is approaching fast. Apply before September 25th 12:00 CEST to be among one of ESCMID’s grantees receiving 20,000 EUR. For detailed information and guiding materials, have a look at our website. Quereda et al investigated the role of surface protein Internalin B (InlB) in the virulence of the L. monocytogenes lineage I strain F2365, which caused one of the deadliest listeriosis outbreaks in California in 1985. The team found that the F2365 InlB+ strain expressing InlB was more invasive in HeLa (~9-fold) and JEG-3 (~1.5-fold) cells compared to the F2365 strain. 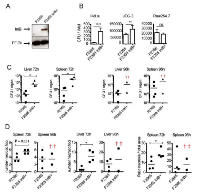 In livers and spleens of infected mice at 72 h post-infection, bacterial counts were significantly higher for F2365 InlB+ compared to the F2365 strain (~1 log). Furthermore, histological examination revealed a reduced number of necrotic foci during infection with the F2365 strain compared to the F2365 InlB+ strain (Mann-Whitney test). In conclusion, the authors propose a critical role for InlB during infection with a L. monocytogenes strain (lineage I) and suggest that a spontaneous mutation in InlB could have prevented more severe human morbidity and mortality during the 1985 California listeriosis outbreak. The preliminary programme for the 5th ESCMID Conference on Vaccines has been announced, and can be found here. The conference will be held in Bilbao, Spain, 6 – 8 September, 2019. Registrations will be opening in spring of 2019.